You’re never too young to learn when the material is presented in the right way. 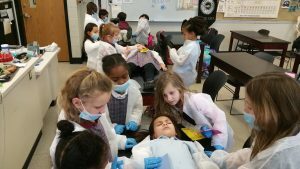 That appears to be the philosophy behind a unique program with the goal of introducing elementary school children to the medical field. It’s the “Little Veterinarian School” offered by Avon Lake’s Parks and Recreation Department, designed to introduce children to medicine through the study of animal health. LaShaun Perry, a Registered Nurse and director of Little Medical School Northeast Ohio, describes to Bob Tayek this local example of the kind of national after school programs that may well be providing extra-early starts for future medical professionals.